These Cornflake Cookies are irresistible! With a crunch outside and a soft and chewy inside they are what the perfect cookie is made of. 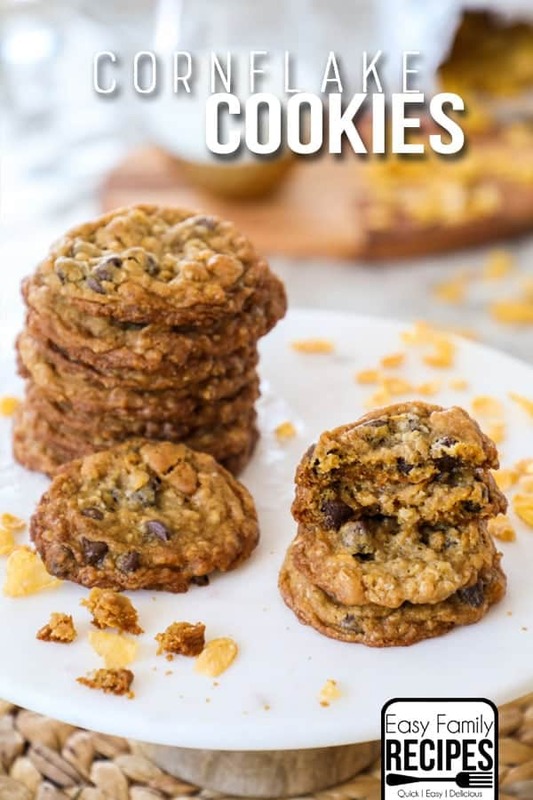 The addition of cornflakes give these cookies a little extra boost in both flavor and texture. If you haven’t tried them, what are you waiting for! One of my favorite memories of growing up was spending time in the kitchen baking with my mom. No matter what I came up with the craving for, she always made time to cook and bake with me. We had many cookie recipes we rotated through growing up but I always really loved these Cornflake Cookies when I was a kid. They are the perfect combination of sweet, but not too sweet. Crispy on the edges but soft and chewy in the middle. The cornflakes give it that little something extra, where you don’t quite know what it is when you are eating it but it tastes really special. Fast forward 20 years and somehow it has been almost that many since I last made these delicious little things. Thank goodness that January and all those healthy goals are over now and I can get back to the important things in life like making and eating cookies. And I might make up for that whole month of healthy eating because once I had these again, I remembered just how good they are! These cookies follow a pretty basic cookie recipe. First the butter and sugar is creamed together and the egg and vanilla added. The dry ingredients are sifted together and the oatmeal is added. It is important to use quick cooking oatmeal so it can really incorporate into the mixture. If you use regular oats it will end up with a much chewier texture. The dry ingredients are mixed into the wet ingredients and then the extras are added. I think these are fantastic with chocolate chips and always include in mine! I sometimes include nuts depending on who I am making them for. I like them best with chopped walnuts or pecans if I am using nuts. The very last thing to mix in is the cornflakes. You want to mix them in gently so they don’t get crushed into the cookie dough, but instead stay as intact as possible. Try to mix them in as throughly as you can throughout the dough as possible being gentle. I use my medium or small cookie scoop to make these. You can make cookies any size you want, but I find that about 2 teaspoons is a nice size. The recipe nutrition info is calculated for about 2 dozen cookies which would be about the size of a medium cookie scoop. When you bake the cookies keep an eye on them toward the end so they don’t over-cook. When they are done, the edges will be golden brown and the middles will lose their shine. The whole cookie won’t be the golden color, just the edges for pure perfection, although if you are one of those crazy people who prefer crispy cookies then you can leave them in a couple minutes longer to get a fully crispy cookie. 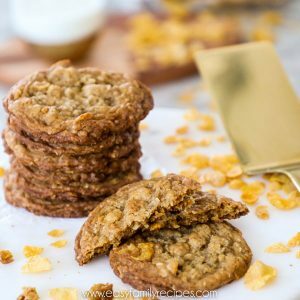 I really hope that you love this Cornflake Cookie recipe as much as we do and that you can make some memories making this one with your kids! If you do get a chance to make it, I would love to hear about it! You can leave me a comment below, or if you post a picture on your stories or Instagram feed, I would love you to tag me @easyfamilyrecipes so I can see what you are making! Oh and before you go… I invite you to join me in my Hungry Email club where I share the best recipes I have been making and eating! It’s free and you can sign up here or by clicking the button below. The Cornflake Cookies are the perfect combination of soft and chewy in the middle and perfectly crispy on the edges. They have a great flavor and the addition of the cornflakes gives them a little something extra that makes them quite irresistible, especially when warm! Grab a glass of milk and enjoy! Sift together flour, measure, add baking powder, baking soda, and salt, then stir in the oats. Cream butter, add sugar gradually. Mix until light. Add well beaten egg and vanilla. Mix thoroughly. Add flour mixture and stir until combined. Stir in chocolate chips and nuts if desired. Last of all, lightly stir in corn flakes. Using a cookie scoop, take small portions of batter and drop on cookie sheet. Bake for 10-12 minutes or until the edges are golden brown and the centers are set. Cool for 2 minutes on the cookie sheet, then move to a cooling rack. Nutrition facts provided based on my best estimation for the recipe and may not be accurate depending on what brands you use or modifications you make to the recipe. I recommend using a nutrition calculator with the exact brands, measurements, and yields you use for the most accurate calculation. My husband just made these using Kellogs Chocolate Frosted Flakes. They are delicious. No need to add chocolate chips. Recipe will be used again. My mom has ask me to make them for her.She just love this cookies. So I am makeing 4doz more for her and some for my husband and friend. Thank you for sharing.